I’ve decided to focus on how I’m using my words. Both the words I speak out loud, and the words I use in my head to talk to myself. Below I’ve pulled together the tips I’ve come across over the years. Maybe you want to play with some of the ideas, too? Remove “I think” from the beginning of sentences. Eliminate the use of “maybe” when responding to something. Avoid “sometimes” when describing something. Use “I will” instead of “I’ll try”. Avoid getting overly involved in the details of a story – make my point. Use “I can”, “I do”, or “I will” instead of “I can’t” or “I don’t” or “I won’t”. Use “Could” rather than “Should”. Use “I get to” in place of “I have to”. Ask “What?” instead of “Why?”. Say “And” in place of “But”. Allow silence versus filling space with words. Thanks Vicki. Simple and practical insights. Great to hear from you Anna! Glad you found the post practical! 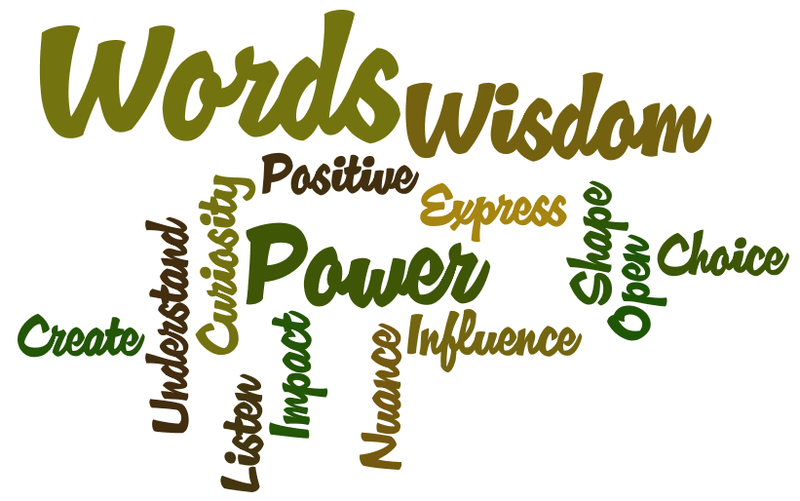 And, a long overdue thanks to Lorian for sharing your experience with the power of words!